08H20G4-48P problems after power outage. I am having issue with 08H20G4-48P lately. After a few power outages the switch does not forward any traffic. I can access it remotely via Web GUI and via ssh without any problem. But I can't access any other devices that are connected to it. Also the connected devices can't access beyond it. Rebooting it via cli or powering off/on it solves the problem. What should be the problem? It has latest available firmware installed. perhaps you've hit that weird forwarding 'feature' which disables flooding. check your config, does it have any 'disable flooding' commands? try " enable flooding all_cast ports all"
Well, it does not accept any commands like "enable flooding". Hi Rahman, Stephen is referring to the issue which is documented in this link https://gtacknowledge.extremenetworks.com/articles/Solution/Traffic-is-filtered-by-the-switch-with-default-configuration if you still could not execute the command can you post the "show switch" and the output what you get during the command execution. You see, if you work with these steps you should have an better understanding where the problem is located. Well, my bad, I did not explain the issue well enough. The switch is connected to a G3G124 via fiber port. There are two B5Gs connected 08H20G4. All switches' management vlans are vlan 1. There are also vlan 100, vlan 101, vlan 70 on the switches. G3G is the router for all these vlans. 1. I can ping the 08H20, I can connect to it via ssh and can connect to it via web gui. 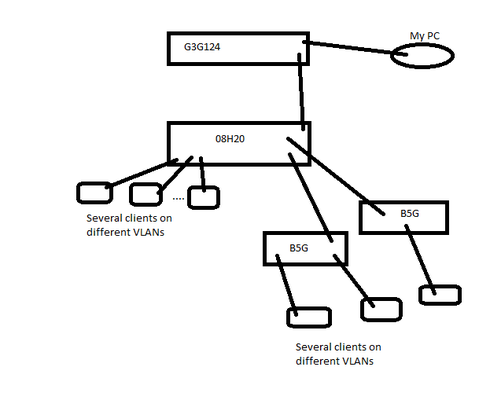 So vlan 1 through G3G to 08H20 is forwarding and working. 2. But I can not ping or access to two B5G from my PC. 3. I connect to G3G via ssh. G3G can ping the 08H20 but it can't ping any of the B5Gs even their management ip is on vlan1 like 08H20. 4. So I connect to 08H20. This is where it gets funny. Because 08H20 can ping both B5Gs. If it was a port blocking issue, 08H20 should not ping B5Gs. But it can. The clients that connected vlan 100 can ping each other but can't ping other vlan clients. I know it is confusing. I am confused. If it was all working behind 08H20 but could not accessible form G3G side I should check the fiber port and connection. But it is not the case so I am really confused. This setup was working for more than 2 years and there aren't any config changes lately. It is always happening after some kind of power outage but does not happen when we power off/on it. I am suspecting some king of hardware issue but I need to find a way to reproduce it. you should collect the data in the steps i send, that would help to see where the MAC addresses are learned. I would also try in next case to disable the port to the B5s and enable it again. Once you have that done and logged the data as documented, you should make a case to the Support GTAC Team and they can analyze the data you collect.